Since their Kendal training event, the GB National Development Squad has had a bouldering focus weekend at Mile End Climbing Wall in London. The squad had a great weekend testing out lots of new problems and hold types which can’t be found anywhere else in the country. We would like to extend our thanks to Mile End for hosting this event and the time and effort the staff put into the route setting and how accommodating they were at the event. Thank you Mile End! The GB National Development Squad then most recently travelled to Sheffield for a weekend of bouldering and route climbing. The event started out at The Climbing Works where the new Unit E was set with competition style boulder problems and the whole of the competition wall was reset for the event. Again the squad were able to hone their competition skills on the competition wall on new holds and volumes, rarely seen in the UK. Thanks to the Climbing Works for its hospitality, route setting and endless coffee making! On the second day the athletes moved on with what fingertips they had left onto route climbing at Awesome Walls Sheffield. It was a hard set of routes but a great opportunity to get used to their pre competition routines. 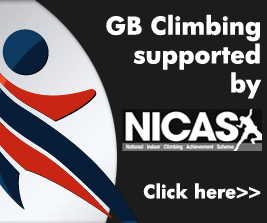 Alongside this we have to thank Allan Bownes from the Scottish Speed Climbing Squad for coming to give our athletes guidance to help them to develop their speed climbing on the speed facility at Awesome Walls, Sheffield. Again, we thanks Awesome walls Sheffield for accommodating us and allowing us to reset on large parts of the wall and again endless coffee making. In Sheffield we also had the honour of a questions and answer session with Will Bosi and Shauna Coxsey where the squad athletes could ask them questions around their climbing and training lives. We can’t thank Shauna and Will enough for coming to support the Development Squad and giving their valuable time. We wish Shauna, Will and all the GB Senior Team all the best for thier first event of the season in Meiringen this weekend as the Senior International Season begins, which also signifies the road to the Olympic selection. Good luck to all! Follow IFSC Competitions through the IFSC website here. Following a scheduled annual review, the selection policy for the 2020 GB National Development Squad is now ready for publication. The BMC is grateful for the feedback received on last year’s selection process; all points submitted were considered and evaluated against the purpose of the Squad. This article seeks to explain the main changes for the 2020 squad selection.